The "Ideas Taster" is the adviser to the dwarf's Low King in Terry Pratchett's Discworld. And ideas tasting is the best description of what a good museum visit should be. I felt I was tasting ideas as I wandered around the Museum Berggruen. The museum is a stone's throw from the pretty little Schloss Charlottenburg in Berlin. Inside is a collection of three main artists; Henri Matisse, Pablo Picasso and Paul Klee. The personal collection had been built by Heinz Berggruen. He was an art dealer and a friend of the artists. Wandering around the radial galleries, I was struck by the many portraits. There were not only the differences between the artists, each artist showed great variety in their own styles. The Picasso collection showed that he was constantly learning from other artist's ideas. For example, his friendship with Braques resulted in cubist images. There was a clear influence of African art in his studies of faces. 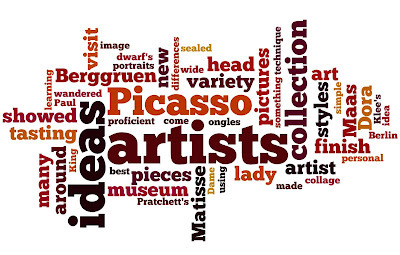 I was amazed by the wide variety of styles that Picasso used. This was so different from the schoolboy perception of artists using each new style, one after the other. They were all technically proficient artists. You could however see from the finish of many of the pictures, that the idea was more important than the finish. Often works were done on irregular pieces of paper. On a study for a poster by Matisse, some of the collage pieces were wrinkled after being glued on. What did come through was the sense of humour and play. This is very apparent with two of Klee's pictures. First, The Lover (der Verliebte). Here the bubble head of the lover contains the image of the lady of his desire. Second, the sealed lady (Versiegelte Dame). The red seal on her lips draws the eye. The head is made of "simple" curves, but you immediately get the artists pun. My favourite picture? Dora Maas with green finger nails (Dora Maas aux ongles verts) by Picasso. So what lessons did I learn from my visit? At first, worry less about technique. Is there an exhibition or an artist whose work you really learnt something from?